The following is based on a telephone interview with Emma Webster on 27th October 2017. The Joiners opened in 1968 so it will have been operating as a full-time touring venue for fifty years next year. Back then it made its name with country and bluegrass, just like the famous CBGB venue in New York. The front of the venue is a pub with the live room upstairs, but we only open when live music is on so it is a live music venue rather than a pub. 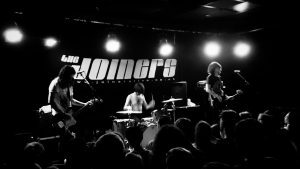 Over the years The Joiners has put on thousands of bands, some of whom have gone on to be huge, including Arctic Monkeys, Franz Ferdinand, Oasis and Coldplay. We are at the forefront of small venue touring in the country in terms of professionalism, and have some of the best sound and lights in the country for a 200 capacity venue. We were voted best small venue by NME in 2013, and I visit venues all around the country so I see the state of some of the other venues so I’m fully aware of the drastic situation some venues are in. There are more venues in Southampton now than there were five years ago when I started doing the bookings for The Joiners but there are still some big gaps in the city’s venue provision. Bands start off by playing in pubs; usually these are very loud with people talking so the musicians can’t hear themselves and the people in the pubs don’t want to listen anyway. The band might then play a 100 capacity club night with bands, then move to playing a 100-200 capacity touring venue like The Joiners, which is 200 capacity—and when you sell out The Joiners you’re ready to move on to the next level in the music industry—then on to Talking Heads which is 300 capacity. Then the next venues up in Southampton are 800 capacity—Engine Rooms and 1865—and then there’s another jump up to 1,800 capacity with the O2 Academy. So there’s a big gap around the 500 capacity venue size and we lose a lot of artists because of this; they tend to play venues like the Wedgewood Rooms in Portsmouth or Concorde 2 in Brighton. We grow bands to being able to sell 200 or 300 tickets, but because there isn’t then a venue for the next step up we then lose bands to cities like Portsmouth and Bournemouth and to national promoters like Live Nation and AMG. We lose our relationships with the bands that we helped to develop because their agents just jump to a different city, which is frustrating when you’ve worked hard to grow that band. The whole live music system’s changed since I first started promoting eleven years ago. What used to happen was that the band would charge a £500 guarantee and the record label would pay an amount to support their ‘per diems’: their food, travel, etc. Now that record labels have stopped making money because you can just stream everything for free, the record income has shrunken hugely and so has tour support for bands. So that revenue now has to come from the live sector, which is ticketing, which is us. The labels can’t afford to put their bands on tour and therefore the price of a band now is three or four times more than it was five years ago because that revenue stream has to come from somewhere else for the band to keep touring. So as well as the £500 guarantee, bands also take an 80% profit cut on top of their guarantee. On 200 tickets, that means that the venue’s 20% is very small. If we put on the 800 capacity shows in external venues then we can make up to £1,000 possibly on a show, which goes straight back into the venue, on new microphones or XLR leads or on the general upkeep of The Joiners. The impact from summer festivals: the touring season starts the second week of January to the second week of June and then its festival season for 10-11 weeks. As soon as the Isle of Wight Festival begins, no-one tours and we can’t get bands in so we tend to rely on local bands to keep us going over the summer. I essentially don’t pay myself for those two months; we just pay business rates and rent on the building, so I have to forfeit money and so does everybody else; I work at festivals over the summer to get by. I talk to other venues like the Winchester Railway and the Wedgewood Rooms and they said that this summer was the worst summer for bands coming in years. Six or seven years ago I could get around twenty local bands who would fill the venue but I can only think of six or seven bands who could do the same now. The general public don’t seem as interested in going out as they used to; 14-30 year-olds stay at home, watching Netflix, playing computer games, avoiding being social with each other; there’s so many other distractions now. And that’s affecting all venues all over the country; it all has a snowball effect. The other side of this is that acts are signed to festivals not to play the vicinity of the festival—sometimes even in the same county—or they can only play one show in a six week period, therefore eliminating their ability to play other shows anywhere in the country. Agents, managers and labels are all in a panic/competition for their band to do well so they will sign bands up to these exclusivity contracts. The other problem is that national promoters like Live Nation & AEG almost have a monopoly on the festival market so it’s tempting for agents just to book an entire national tour with them so that their bands get to play Download and Reading/Leeds or BST. I was told yesterday by an agent that I was being outbid on shows by national promoters. I was completely flabbergasted; I didn’t know how to respond to that. I was like, ‘We’re an independent venue, and we can’t give you £3,000 to play at our venue!’ The response was essentially: ‘Money talks’. But that’s part of the problem! They’re destroying the touring industry. It’s just greed. It’s completely non-constructive, they just see it as a financial battle. Especially when we have supported the artist in question for years when they were smaller and then they want to come back and do a smaller show with us but because we wouldn’t pay the ‘asking price’ the agent was requesting then we get told to go away! But that ‘artist’ wouldn’t be where he was if it wasn’t for places like us! The bands make more money if they do the show with the venue directly than they would with a national promoter, but because they get the sweet talk of ‘We’ll put you on a stage at Reading’, the agents and managers want success for their artists so they jump at the chance. The buying and selling of acts by national promoters all comes down to money rather than trying to build a sustainable national touring network. If something isn’t done the bottom end of the music industry will collapse and there will only be venues of 500 capacity and above, which is no good for bands starting out because shows in those venues are too expensive to run when bands are just starting out and would be mostly empty. One thing that would have an immediate effect on us would be to reduce or remove the business rates that we have to pay. Theatres get tax breaks on their tickets and their tickets are usually higher than ours. We paid 20% on all of our tickets to the government in tax and then give up 80% of our profit to the bands, that’s 100% gone. We don’t make any profit on tickets, so that’s why we say it’s a non-profit business. The only money we make is on the bar but we only make 30% on the bar so we have to survive off that 30%. The UK is the only country in Europe that doesn’t support its independent music venues. Venues in France, Germany, Belgium, Portugal, Italy, they all get tax breaks. They’re exempt from high business rates because they’re treated as a cultural asset for the city or the town that they’re in. Also in places like Germany or France, for example, for a big stadium gig, the government will force the promoter to give back 3-4% on tickets to go into a small venues fund for repairs. The Joiners building is 120 years old and we have an ‘all-repair lease’ which means that we’re responsible for all repairs, so, for example, if someone kicks a hole in the wall in the mosh pit then we have to fix it. We’re almost a family business in the sense that everyone chips in—engineers, bar staff, etc.—when something needs to be done. We all pitch in to keep it going because it’s our livelihood too. Bad weather is a problem because we have a pointy roof, like a church roof, so the rain collects on the flat sections. After the torrential downpours we had in July, the roof partially collapsed and we had to close the bands’ private smoking terrace because otherwise bands would have fallen into the girls’ toilets. This year we raised the money to repair the roof via a crowdfunding campaign. We didn’t want to ask for money but it happened during festival season where we have no money, so we had to do that or not be able to open before bands started touring again. We got an amazing response. Artists like Frank Turner and Enter Shikari, bands from the United States and Germany, all got behind it and all tweeted about it; they took it upon themselves to share it on social media. The bands were like, ‘This venue has always looked after us since no-one cared about us. You should care about places like this’. Initially we asked for £5K but we overtook that in two days, so we stopped the campaign after six days when we’d reached £9K. The crowdfunding site takes about 15% so we got about £7.5K in the end. It really shows that people care and how much they love the venue, how much it means to them. We have a 14+ licence which is something that I have always taken a stand on because it’s important for young people to go to gigs. It’s the place where people discover their best friends for life, meet their first girlfriend, or see their first band. A lot of venues just panic and do over-18s only because of the loss on the bar with the crowd obviously not drinking, but you can’t just take away a teenager’s right to go to these things just because they’re not going to drink. They’re part of the music community. I was a kid who grew up on an estate and otherwise you just end up getting into trouble because there’s nothing to do. So it’s part of trying to introduce how important music is. I’m very passionate about bringing the young people in and showing them how important venues like this are. And we’re not just about live music. We have 600 music students from Southampton Solent University and we go and talk to the students on a regular basis to teach them about being a promoter and what it takes to run a venue and progress further afield. The students come into the venue during the day and learn at entry level everything from lighting, sound engineering, promoting, marketing, crew, box office, the list goes on, and so we are key player in growth for the future of the music industry.